There’s Giordano, the brand we grew up with as teenagers. 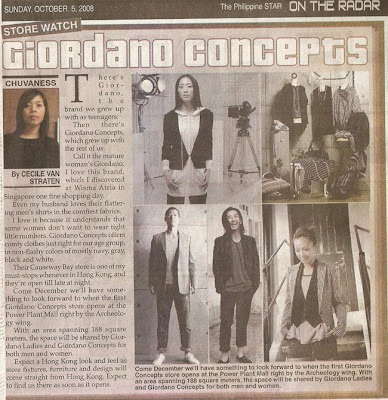 Then there’s Giordano Concepts, which grew up with the rest of us. Call it the mature woman’s Giordano. I love this brand, which I discovered at Wisma Atria in Singapore one fine shopping day. Even my husband loves their flattering men’s shirts in the comfiest fabrics. I love it because it understands that some women don’t want to wear tight little numbers. Giordano Concepts offers comfy clothes just right for our age group, in non-flashy colors of mostly navy, gray, black and white. Their Causeway Bay store is one of my must-stops whenever in Hong Kong, and they’re open till late at night. Come December we’ll have something to look forward to when the first Giordano Concepts store opens at the Power Plant Mall right by the Archeology wing. With an area spanning 188 square meters, the space will be shared by Giordano Ladies and Giordano Concepts for both men and women. Expect a Hong Kong look and feel as store fixtures, furniture and design will come straight from Hong Kong. Expect to find us there as soon as it opens. wow!! great for u guys over there. we have one here in malaysia at pavillion. i bought the grey dress n a loose black t from giordano concept. its comfortable, loose yet trendy.